I couldn’t wait to meet you. I had seen photos of you that your mom had posted and you looked beautiful. With your big pink ears and soft, sweet features your name perfectly suits you. It was so heart-warming to see you surrounded by your animal friends at Ziggy’s Refuge, because when I’ve seen your kind before it hasn’t been at a kind place like Ziggy’s. I’ve seen your kind in scary silver trucks with holes in the sides on their way to a frightening place. They don’t get to grow up in a safe, peaceful, and loving environment. They grow up in cramped spaces in dark buildings with no ability to roam the outdoors, like you have the ability to do. And they only live a couple of months before they reach the end of their journey here on Earth. You are special, Sweetheart. This could have been your fate, but you were rescued and now get to grow up and live your life in a sanctuary. It brought such joy to me seeing your smiling face as you wandered eagerly among a group of volunteers, seeking their attention and wanting to be loved on. 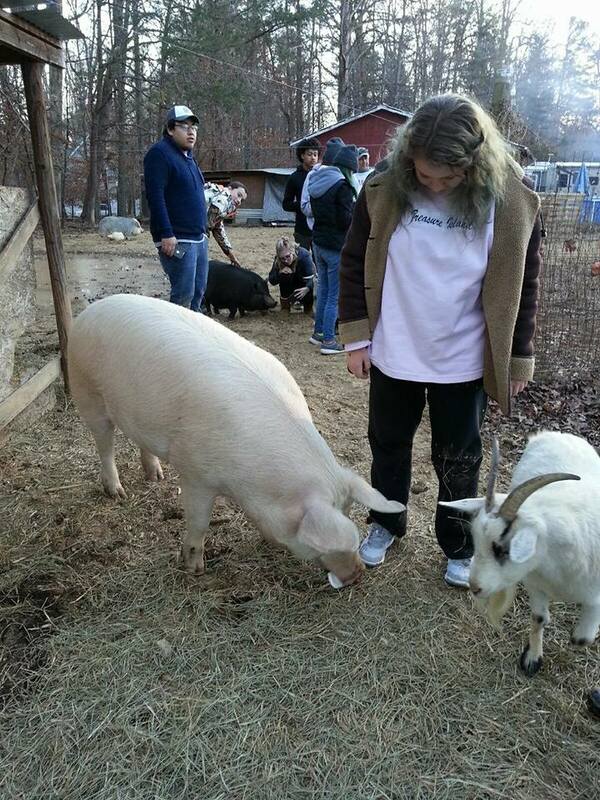 You trotted alongside us as we toured the farm and were able to see your other animal friends at Ziggy’s Refuge. You’re special, Sweetheart. You have a wonderful home and wonderful parents who will love you as long as you live. I wish all of your kind could get to experience the love and compassion you receive at Ziggy’s Refuge. And there are people out there, like your mom and dad, who are trying to make that happen. 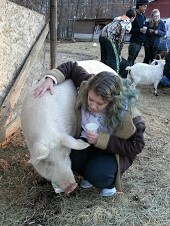 I thoroughly enjoyed seeing your other animal friends at Ziggy’s Refuge. Looking at Toby the turkey and petting his soft coat of feathers I was saddened to think that millions of people consume his kind every year. Toby is sweet and has his own personality, just like all the other animals at Ziggy’s, yet his kind are treated like objects instead of the sentient beings they are. They’re separated from their mothers and raised in closed up sheds with no access to the warmth of the sun. And after only a couple of months they too reach the end of their life here on Earth and are transported to that frightening place I mentioned earlier. The same can be said for the spunky chickens that you also share your home with, Sweetheart. Their kind live in hell every day and they don’t get to experience the feeling of dirt and grass beneath their feet. They don’t get to run around with their friends and play like the chickens at Ziggy’s Refuge. You’re special, Sweetheart. You and Ziggy stand as a reminder that the farm animals we consume have personalities, emotions, feelings, and just want to live in peace on while they’re on this Earth! You and your parents show the world how your kind can live, and how all animals should live. I was blessed to meet you, Sweetheart. You make me want to fight even harder for the rights of animals. I’m sorry that every day my kind consume your kind and those like the other animal friends at Ziggy’s. I wish more people would open their eyes and their hearts to see the harsh reality of what all farmed animals have to go through. I miss you, Sweetheart, and all of your other animal friends at Ziggy’s, but I’ll be back soon. You’re special, Sweetheart, and you hold a very special place in my heart. To the people who contributed to making Ziggy's Refuge a reality, I want to say thank you. We all helped make Kristin and Jay's dream a reality. I know most of Ziggy's supporters most likely do not eat meat, and may not eat other animal products, but for those of you who do I have something I'd like to say. All farmed animals deserve to live like Sweetheart and Ziggy do. Chickens, turkeys, cows, etc. are all abused and tortured every day just so we can consume them. Most of them live in absolute hell. I know it can be hard to open yourself up and allow yourself to see the harsh reality of what these animals go through, but sometimes it's necessary. It's okay to cry and get angry, and it's worth it because once you make that connection to what you're eating, and then you stop eating it, it's amazing. It's RELIEVING. You feel happy and awakened and filled with joy! If you eat other meat (except for pork), I would ask that you would take the plunge and ditch all meat and other animal products, because all farmed animals deserve to live like the animals at Ziggy's Refuge. There are amazing meat and dairy alternatives out there so I promise you won't lack for anything. Please take the plunge and go all the way. My mother and I would be happy to offer help and suggestions for meal ideas and planning. "Peace begins on your plate."